Play With - From classic toys you remember from your own childhood to ultra rad remote control cars, we have the toys your child will remember for a lifetime. Learn With - Kids are learning all the time. They are challenged with problem solving, hand-eye coordination, developing motor, language, and social skills, and learning about the world around them. With toys from Childish Toys, they'll have so much fun they won't realize how much they are learning! Grow With - Kids don't stay kids very long, and Childish Toys has the toys and games to help them grow and toys you can depend on to help your child play, learn and grow. This ship-shape puzzle is a great gift for mateys 6 years old and older looking for adventure on the high seas. The 80-inerlocking pieces come together to make a puzzle with enough detail and visual surprises to keep every little pirate lover searching for treasure long after they put the final piece in place. The perfect gift for future fire fighters, the Fire Fighter Casting Kit has all the materials you need to make a fireman, his truck, his Dalmation, and a fire hydrant. Make the casts, let them dry, and then paint for your own unique creations. Makes a great family or group craft activity. 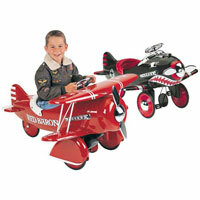 The Deluxe Blue Roadster Pedal Car is the ultimate in kids roadsters. Featuring an all-steel body, rubber tires, padded seat and adjustable pedals means a perfect fit for your little driver. Plenty of authentic details, including an authentic chrome bumper, hood ornament, and a spare tire mounted in the back. A new kind of action hero! The Wild Ones Adventure Crew - Rock Climber comes fully equipped with everything he needs for adventures. A full 6 1/2" high, Red Dogg the Rock Climber comes with helmet, sunglasses, GPS, clamps, backpack, climbing hook and rope, climber's suit, and three suction-cup rocks for hours of action and exploration. Missy Cheesie combines two toys every toddler loves. A pull toy complete with a colorful shape sorter, Missy Cheesie will keep your toddler entertained and learning for hours on end. Everything your little mad scientist needs to create his or her own experiments. With the Scary Sight Science Kit you can make a haunted house with its own ghost, a scary sight eyeball that really works, and several other fun experiments! Comes complete with all the lab supplies Dr. Kidenstien will need, and a 16 page Lab Notebook filled with easy-to-follow instructions for the experiments and other great information.